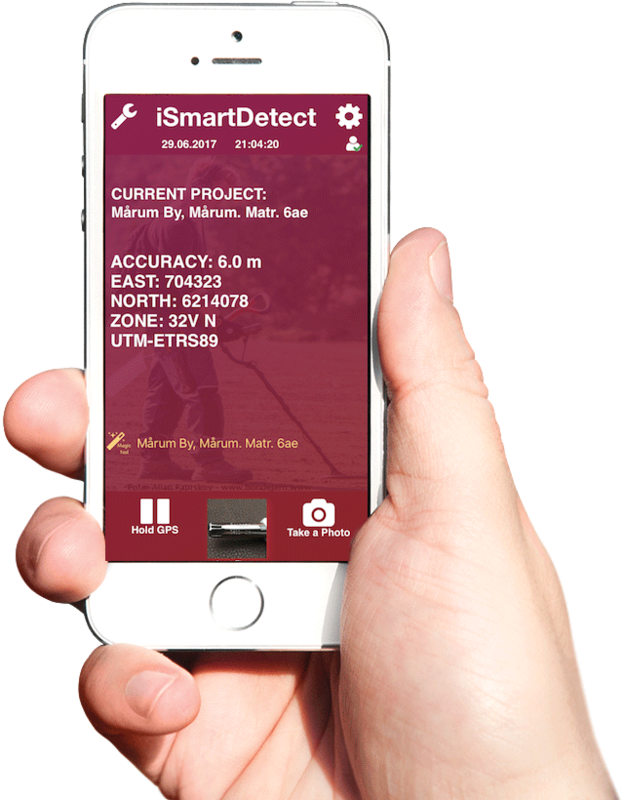 iSmartDetect is developed to assist amateur archaeologists, and metal detecting users to record their detector finds in the field. The application will help you take your find photos at the spot in the name of “on-site” photo documentation. The photo taken will automatically show the GPS coordinates, with the Datum (GPS system), date and time, and a unique ID number with your initials on each photo. You can add project names and/or your text on the picture, and it will automatically stamp on the image. Easily save your pictures in albums with your predefined project names that you have already created in the app. You can even define each detector find with personally made categories such as ‘Roman coins’ or ‘Viking Fibulas’ for example. You can then see their waypoints on the map, with up to nine different colors. This feature gives you a great overhead view of how your detector finds from each category are spread over the field. With the server plan service, store data on an encrypted server with login option, multi-user functionality, and safely backup your information. Also in the paid plan, export CSV/KML/PDF files, download or use the email functions. The server plan takes iSmartdetect to the next level. 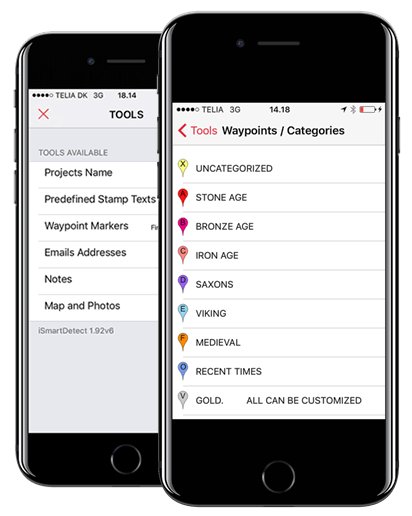 Danish users also get a “magic tool” to create a project. Matrikel number and town can be found using the one touch magic tool. It is very easy to use, and it will save you a lot of time. iSmartDetect development team: Richard Rodriguez, Nikolas Gough and Henrik Rasmussen with help from Henrik Brinch Christiansen. Thanks to all our detector friends in Denmark, UK, USA, Norway and around the globe for the great help, and feedback for developing this smart metal detector app. snap a picture and all your data and information is on your phone. Just hold your camera at a distance to take a sharp, good picture of the object and use the zoom tool on the image, adjusting it to the size you want. Customize how you stamp your picture, either with the project name, your Predefined Text or initials, together with the Date, Time, and Coordinates. There are even two extra options; save a picture without stamp and save without GPS. Customize how you stamp your picture, either with the project name, You will love the way the save and store function works. Your picture goes to the album/project name you have made in the Tools Settings. You even get a warning if your project is more than 500 meters away from other pictures in that album. This is the heart of your new app iSmartDetect. Here you set and handle all you need to help you save time and enjoy your detecting. You can name your album/project name just how you like. Pictures taken can be sent by emails to a specific list you already defined. This function is free to use, activate it when you want. Open this function and you will love how you can work with your files and photos. All your waypoints and spread card in a project can be studied on Google Map. You can Export CSV and KML files or you can send PDF or just an email. Using our server (sign up) you also can watch and work with all your pictures stamped with your information, stored by the app. Make your own notes inside the app, easy to handle and use. The Predefined Texts are made to save time. Often the same text will be used picture after picture. This tools will remember the last text you defined that you want to use in the next pictures. How do you prefer to use spread card and waypoints? We made this tool universal to all users. You get 9 different Color Waypoints you can define just how you prefer. Outstanding functionality that you can use on the same account (email) on several devices. iSmartDetect works with your iPhone and iPad and even simultaneously. So far we haven’t found the limit, but small Rallies can use the same account and all finds at the rally can be stored safely on one account with all the benefits of that account. All the Tools are auto-syncronized. Add a predefined text and all devices will get it in a few seconds. Wouldn’t it be cool is all your records, waypoints and pictures could be connected to your detecting buddy’s smartphone and his/her records? It’s already possible! Just enjoy and log in at the same account (email) and see how great this tool is. iSmartDetect is made to satisfy not only the amateur but also the professional archaeologist. Records need to be accurate and easy to store. With the multiuser function, not just one, but several employees at a Museum can now use the same account. And they don’t need to work on the same project because project choice is free to use without influencing other users. All logged in users can download files and pictures if needed.